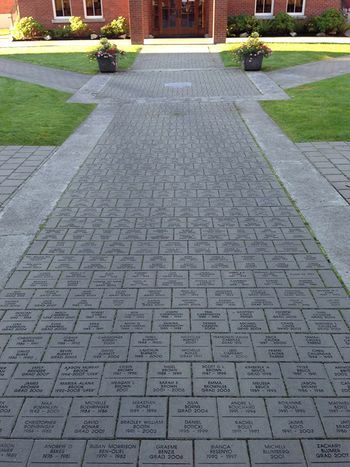 Mortimer's Monumental Works Ltd in Victoria has provided bricks and pavers to assist clubs and communities to raise funds for special projects in Vancouver. Service clubs, hospitals and schools have been very successful selling bricks and pavers with the donors name and message on them. The opportunities are there for you to do the same. At Mortimer's Monumental Works Ltd, we are committed to helping you reach your fundraising goals. We offer a collection of fundraising bricks and pavers of various sizes to fit your specific needs and budget. Our projects include: Royal Jubilee Hospital, UVIC, Royal Roads University, Camosun College, St. Michael’s University School, and Esquimalt. Our brick and paver products are available with custom engraving for fundraising purposes. Engraved bricks and pavers are common and excellent ways to help raise funds for your organization or project. A small investment in fundraising bricks and pavers can help generate a significant amount of revenue. They are also a good way to honour donators or volunteers for the organization, cause or project. Mortimer's Monumental Works Ltd offers custom engraving for our fundraising brick and paver products for your fundraising purposes. We are here for you. Contact us for references and ideas.